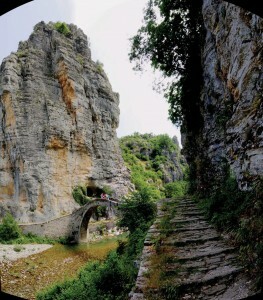 Vikos- Aoos Geopark is one of the four Greek Geoparks and was delighted to become a member of the European and Global Geopark Networks in 2010. It is located in the region of Epirus, Ioannina, NW Greece. It occupies the NW part of the Pindus Mountain Range and is characterized by a high rugged relief and an impressive landscape. It also includes Mt. Smolikas (alt. 2637m) the second highest mountain in Greece and Mt. Tymfi (alt. 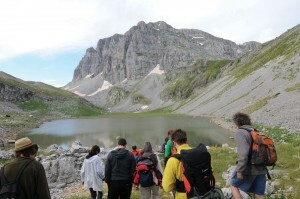 2497m) with the two spectacular gorges of Vikos and Aoos. The Geopark covers an area of 1,200 km² and the 9,500 inhabitants reside in 61 settlements in the municipalities of Zagori and Konitsa. The territory contains several traditional settlements and monuments dating back to the 14th – 19th century including monasteries, schools, churches, chapels and arched stone bridges. Vikos Aoos Geopark is one of the most impressive areas in Greece in terms of its aesthetic values and range of geodynamic processes. Numerous geosites within the territory are situated in landscapes of incomparable beauty. They owe their origin to a wide range of geological processes and are of excellent scientific and educational value. 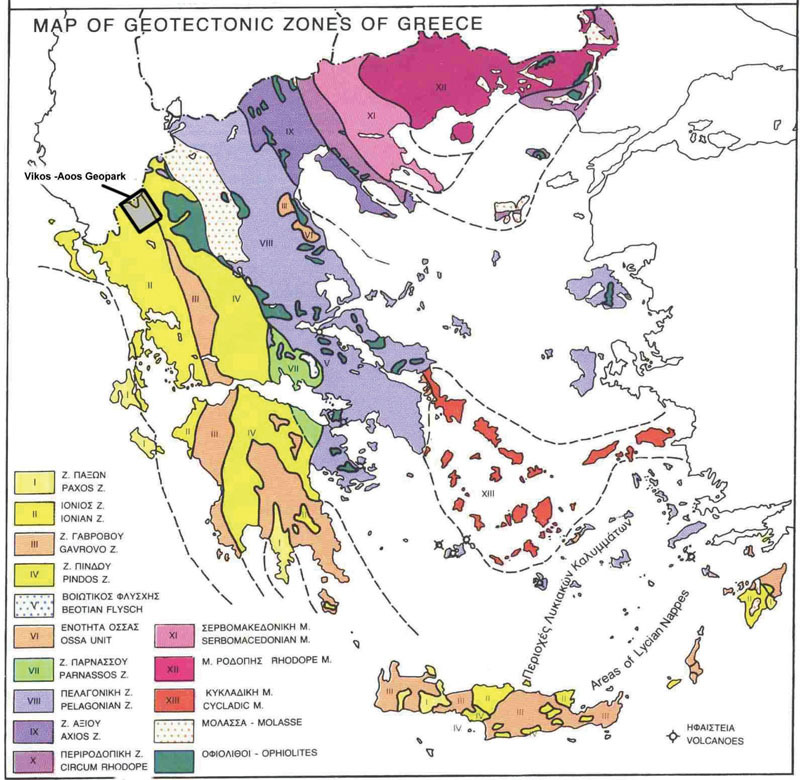 The area of Epirus is characterised by a its strong relief and the significant relationship between geology and drainage resulting in extensive aquifers and many springs. Mt. Tymfi with its calcareous bedrock is associated with steep, rocky slopes and cliffs, deep gorges, glacial lakes, springs, streams and rivers with pure water. The deep gorges reveal the rock sections which constitute the geological structure of the area. Evergreen shrubs, constituted mainly by the kermes and the holly oak, as well as deciduous oak woods occur at low altitudes.They are succeeded at higher altitudes by sub – Mediterranean conifers including black pine, fir and occasionally stinking juniper and beech forests. The mountain tops are characterized by Balkan pine woods and thickets, extensive sub-alpine pastures and bare rock surfaces and screes. In conclusion this exceptionally beautiful landscape is characterised by its high biodiversity with respect to both flora and fauna. More than 2000 plant species grow in the area including several rare, endemic and protected ones. The territory is inhabited by approximately 300 species of vertebrates. Some species including the brown bear, the wolf, the otter, the Balkan chamois, the golden eagle and the alpine newt are protected by European Union and national legislation.